If you could change one thing about yourself, what would it be? My problem is choosing just one thing… At least by next Sunday I should be wearing different glasses. I had an eye test on Friday and need a new prescription. But I felt like changing my image too. So I hope you like the new frames. It’s the new me. Some things we long to change. Others we don’t want to change. This Summer I turn 60. Apparently my children want to celebrate. I don’t particularly. This hit home a few months ago. I was on a London tube train during the rush hour, carrying a rucksack. An Asian gentleman got up and offered me his seat. I didn’t know what he meant to begin with. Then it dawned on me. That was the first time anyone has ever offered me their seat. I felt acutely self-conscious. Ageing is an irreversible change. We can deny it, resist it, botox it, liposuction it, hide it, disguise it, colour it, ignore it or, we can accept it. Rick Warren says, “A life that is never willing to change is a great tragedy – a wasted life.” That’s because God actually wants us to change. Because change is a necessary. Change is an inevitable part of a growing spiritual life. We need to change continuously to become like Jesus. How Can I Ever Change? from Stephen Sizer on Vimeo. The Bible says lasting change takes place on the inside not the outside. The encounter between God and Jacob in Genesis 32 serves as a dramatic example of what God will do, if necessary, to change us. Jacob was something of a shifty character. His name literally means ‘cheater’ or ‘schemer’. At least that is what his early life was like. But the encounter with God in Genesis 32 transformed him into a new person. He became Israel – after whom the whole nation was named. Please turn with me to Genesis 32 and lets see how God uses a four step process to help us overcome our weaknesses, our deficiencies or sin, to become the kind of people he intends us to become. As we just heard in the Bible reading, Genesis 32 tells the story of how, alone one night, Jacob encounters an angel. He then wrestles with the angel for hours until dawn (see Hosea 12:4). So what does a wrestling match with an angel have to do with me changing my lifestyle or habits several thousand years later? Let’s consider four steps required for spiritual transformation: Crisis. Commitment. Confession. Cooperation. When God wants to change us, he begins by getting our attention. He sometimes puts us in a frustrating situation that is completely beyond our control. We cannot win, and we just keep getting more and more tired in the struggle if we resist. He might even have to disable us to get our attention. Last Sunday morning before the end of the service I mentioned that later that afternoon I was flying to South Sudan via Nairobi to help launch Christianity Explored. At precisely 12:08 Craig Dyer texted me from Entebbe airport to say he had been denied access to the flight to Juba because he did not have a visa. The regulations had been changed and no one had told us. Craig texted to say I would have the same problem and would not be allowed to fly from Nairobi to Juba so there was no point getting the flight to Nairobi. I spent a fruitless hour trying to work out how to obtain a visa on Monday morning in Nairobi. The problem was we had flights booked from Nairobi to Juba and then a UN flight from Juba to Wau. A delay in Nairobi would mean losing the other two flights. Better to cancel and see what God wanted us to do. I reluctantly gave up and prayed “Thank you for this change Lord. You have my attention. I now have an empty week in my diary. No appointments. No sermon next Sunday… Now what?” The first step to change is often a crisis. C.S. Lewis once said “Pain is God’s megaphone for a spiritually deaf world.” God uses experiences and problems and crisis to get our attention. If you are experiencing some kind of crisis right now, ask God what change he wants of you, because it will only be for the better. God will allow a crisis, a problem, an irritation or frustration to get our attention. He needs to do this because often we won’t change until our fear of change is exceeded by the pain of not changing. Too often we won’t change a destructive pattern of behaviour until there is a crisis. Don’t wait for a crisis to find the motivation to change. The first step to spiritual change is often a crisis – God getting our undivided attention. After a night of wrestling, Jacob was engaged. He was committed. He was persistent. He was in a situation he didn’t like. But he held on until God turned it around for good. 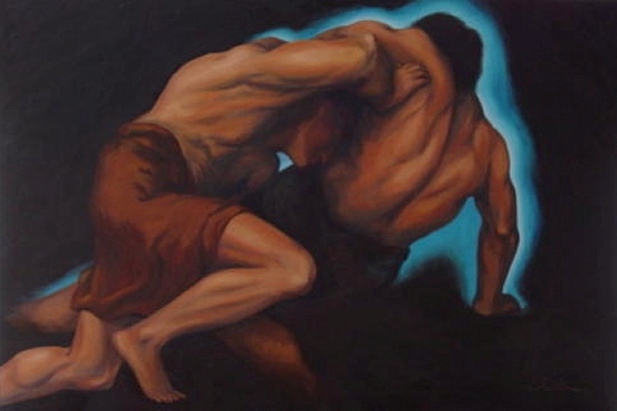 He thought he had problems wrestling with his brother until he wrestled with an angel. But after God gets our attention, he does not always solve it straight away. He wants to see if we really mean business. Many lose out on God’s best because we give up too soon, we cop out or quit. We are conditioned to expect someone to fix a leaking pipe within the hour. We want a dentist or doctor’s appointment today, not next week. We expect someone at the end of the phone 24 hours a day (preferably in the UK) to answer our banking problems, our insurance claim, give us a telephone number or give technical advice. We want instant access, immediate relief, and imminent solutions. And we sometimes treat God in the same way. If he doesn’t answer our prayers straight away, we give up. But you can’t microwave God. Spiritual growth does not come precooked. Answers to life’s problems are not like a ready meal. Often it takes a while for God to change you. Psychologists tell us that it takes six weeks of doing something every day before it becomes a new habit. That is why many never learn to read the Bible daily. We try for a few days, get distracted, feel frustrated, try again and fail. We never get past the six week barrier. That is why for Lent, we are encouraging you to read the New Testament daily for eight weeks using the Community Bible Experience from Biblica. In this version, the chapter and verse numbers have been removed and the natural literary breaks restored. The sub-title is “Discover the whole story so you can live a new story.” You can read it as a book, receive the daily reading on your mobile device or read or listen online. There will be more information in the Enews this week. We must do something every day for at least six weeks before we become comfortable with a good new habit. So whatever you do, don’t give up. There is hope. Hang in there. Don’t let go of God even if he has to bring pain and discomfort into your life to bring about change. The first step to spiritual change is often a crisis – getting our attention. The second is commitment – getting our buy in. Why did the angel ask Jacob for his name? God knew Jacob’s name so why ask? It was to get Jacob to acknowledge his character by saying his own name – ‘cheater’ or ‘schemer’. Jacob needed to realise the heartache he had caused his brother Esau by his scheming. The angel was really asking him “What are you really like? What is your character? Why were you given you this name?” Jacob reply was saying “I am a cheater. I am a schemer.” When he identified his name he was admitting his character. This is an important part of God’s process for changing us. We will never change until we are honestly face our faults, acknowledge our mistakes, confess our sin. God will not go to work on our problem until we first admit that we have a problem. We need to say “Lord I am in a mess. I have a problem. I confess what I have done. I need your help to change.” Then God can go to work. God already knows all about us but he needs us to acknowledge it also. When we confess, we are saying “You are right God and I am wrong” This is how we can begin to become the person God intends. For Jacob, this was much more than a wrestling match. God began to change Jacob as soon as he admitted who he was and what he had done and then began to cooperate with God’s plan. Jacob had literally come face to face with God. Every one of us must come face to face with God. We can do that in prayer and as we read the Bible. When we do, God can change us because his Word is living and active. His Spirit indwells and with our cooperation can fill us and transform us. When Jacob acknowledged that he had encountered the Holy One and had survived, he renamed the place Peniel. “Now we can get down to business. I have work for you to do. But I want you to relax. Just cooperate and trust me, and I will make the changes needed in your life. I will bless you.” God didn’t say “Jacob, try real hard and use all your will power to become perfect.” Jacob couldn’t change his heart attitude toward his brother and family. Because Jacob couldn’t change his nature. But God could and he did. In the past Jacob had learnt to cheat and scheme to get out of trouble. He had run away. Now he couldn’t run. In the future, he would face life’s challenges leaning on God, depending on God. So what about you this morning? What do you want God to change in your life? He will in his way. It may take a crisis to get you to change. It may endure a while until he has your commitment. He will probe you until he has your confession and then, and only then will he expect your cooperation to bring transformation, wholeness and healing. Maybe like Jacob, you have been running away, making excuses, blaming other people, rationalizing your behaviour. It’s humbling to drop your mask and say “God I have a weakness, I have a problem.” Until you do, things will just stay the same as they are now. Someone sent me a poster on facebook this week. It said, Why do we pray “Our Father” on Sundays and live like orphans during the week? God may not send an angel but he has given you brothers and sisters through whom he can help you change. Beneath all those things you know about yourself that you do not like and try and hide from others, God sees an Israel. He sees a prince or princess in you. He sees not what you were but what you can become. He sees your potential and he wants to change you from a Jacob into an Israel. This week let God do the changing. With sincere and grateful thanks to Rick Warren and his life changing book, “Answers to Life’s Difficult Questions” for the inspiration and much of the content of this sermon. This entry was posted in Bible, Sermons, Theology on January 27, 2013 by Stephen Sizer.